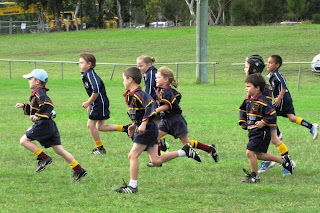 Rugby season for the Macquarie Roos under 8's kicked off this morning with a 9.30am home game. We only found out that it was happening via a text at tea-time last night. 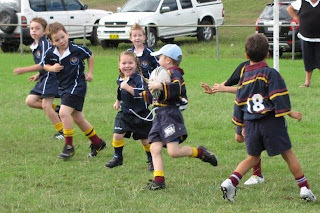 Despite the short notice there was a great turn out of under 8's running around in over sized rugby shirts overflowing with excitement and energy! The other team turned up in much lesser numbers. About 5 of them compared to our big group. A few of our players stripped off their Macquarie Roos shirts and put on the competitions ones to play for them. It was an action packed and exhausting 15 minutes each side! There was a blur of navy blue shirts chasing whoever had the ball with the added confusion of familiar teammates faces on the other team! 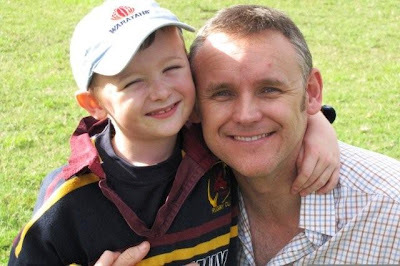 When the final whistle blew the Roos had to concede defeat to the other team who had won 6 tries to 4. 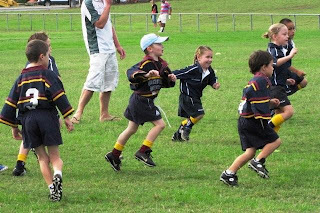 As the kids cheered and drank their cartons of juice the Dads tried not to think about the fact that it was the Roos players lent to the other team that had scored the tries that won the match. No no smiled the Mums, it is not the winning that counts but the taking part.